The centre, Vestlandske Teaterskole was an important place where I trained in theatre for almost 10 years. When I was a child, my dream was to act on a stage. I had access to a lot of theatre pieces since someone in my family was working at “Den Nationale Scene”. The fascination with the theatre was that the actors were in a different reality, a fictional world. The scenography, costumes and all the visual effects also made an impression. Art was also important in my childhood. I started at the art academy after some years and in that setting it was natural for me to work with performance- use the body and work within fictional worlds. The Fluxus movement, Jackson Pollock and Kurt Johannesen opened up something and maybe were my starting points to making visual art-performance. I use different strategies dependent on the setting of the performance. In performance improvisation: It’s good to have a functional visual element to start with, so I often work with a visual element or costume before the session. And sometimes I work with physical training in front of the mirror. Performance at a festival or event etc: One “performance-idea” has often been in process over a long period. The performances have been written about in a project description, with the concept, thoughts, pictures etc. From the point that the concept has been accepted, I work a lot with the visual elements, like the costumes, extras etc. In this case it is also ok to have planned the beginning and end. Long-term projects: The same process and act could be done for years. In this repetitive process, larger and larger documentation is being developed and collected which will form a larger piece one day. 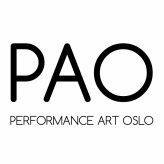 Performance Art Bergen arrange regular open sessions in Bergen. These have been a sketch book for me in developing some new projects which are more physical than earlier works. The work which I will present at the PAO festival, is the result of a project where I explored fabric tunnels and surfaces in different spaces. Another project which I would love to perform is a new interrail performance in Eastern Europe. I would like to travel on the train throughout Europe, observe and create the project, “This book should not leave this country”. Drawings and text of people in the different countries of Europe will then go into an A3 book. The book would then get delivered to different people/intitutions in the country were the observations had been made. Performance and art is important for me, I work with it daily sometimes to produce my own works, organise festival /events/ newsletters and on other days teach. There is usually a performative act or thought in my production of art. The motivation is that its always an opportunity to play or start an act or make a fictive situation in the spaces in which people are staying in. Another motivation is that a performance could add to two dimensional works such as drawings, text, photos, observation. With all this material, the performance could enter into another field such as installation, videos, publications etc. Over the past years, I have been working as a tour guide and teacher at a culture school and temporary art-center. I think the regular reading of theoretical texts and preparation has been a good teaching process for me both theoretically and technically. Performance shoes: Very often in my performances the character is a woman wearing high heels. It started with a fascination about how Black Market was dressed up in black suits in different performances. High heel shoes could also give the impression of a western career women or an office lady. I never wear high heels in my everyday life and it’s a good way to change character. Equipment-belt: This belt gives the possibility to have drawing-equipment available in live situations. Fabric / cotton: Is a good material to make costumes, visual elements, cultural expressions. It’s a material that has been used for thousands of years in all kinds of social settings and demonstrations. This material could be a small piece of fabric or a larger piece. Observation with equipment photo/papers/walkie-talkie/hearing protection: Equipment that is good to have when you do observations of humans in public/private spaces. Public and private spaces are interesting to work in because you never now what’s going to happen around you. The reality is set, things that are happening in private/public spaces are often random and not planned. Festival/ Events are a meeting point with an audience which is interested or curious in visual art/ performance. It’s a meeting place for the public, professionals and the artist. A place where you meet and refuel, get inspired, where you can perform, get focused etc.